This Campaign is to develop, upgrade and modernize the Library and Technology infrastructure on both campuses. To achieve these objectives, we plan to raise US$302,650.00 over the next two (2) years. "The school library provides information and ideas that are fundamental to functioning successfully in today's information and knowledge-based society. The school library equips students with lifelong learning skills and develops the imagination, enabling them to live as responsible citizens " (International Federation of Library Association's (IFLA) Manifesto, 2008). The presence of modern, functioning libraries at Kingston College is therefore critical to the academic advancement and competitive advantage of each student enrolled at this prestigious institution. I am sure you are aware of the important role technology plays in education and development today. It is the generosity of donors like yourself that will enable us to provide the youngsters of our beloved alma mater with this lacking but very key infrastructure which is necessary if we are to continue to compete and remain the preeminent institution of choice for talented and ambitious youngsters today and into the future. Your donation will enable us to provide much needed state of the art library, technology resource center and additional classrooms in the upgraded Douglas Forrest Building. We are in the home stretch of this Campaign and with your help we are committed to break ground Summer of 2016. Please make a contribution today. *Donors' name will be etched into the completed "Donor Wall"- KC's Way of saying Thank You! 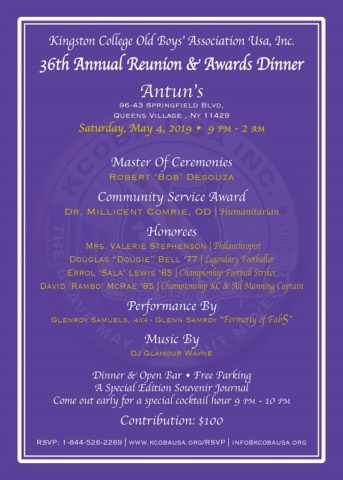 Kingston College Old Boys Association USA Inc.